I've had a couple across all my machines where the "Claimed Credit" was higher than the "Granted Credit"
That happens from time to time in all projects. Nothing to worry about unless it is a major difference, in that case it is normally a problem with your computer. the project is using fixed credit, based on the amount of work generated server side. basically, since the amount of work in a work unit is deterministic, the amount of credit granted is calculated server side and is equal to a function of the number of stars the model is being calculated with and the accuracy of the calculation being done. workunits right now are either 2 credit or 4 credit (although in the future this will change), this prevents any cheating with credits or anything else of that sort. the wu took a lot of time also. i have an amd64 3500 too and this one never need more then 278-280 sec for a ps_ workunit. I understand that we're being awarded fixed credit, was only wondering if there were noisy workunits. Like i said, not all my results are like the one i posted and they're aren't restricted to one machine. Message 951 - Posted: 7 Dec 2007, 13:12:54 UTC - in response to Message 950. 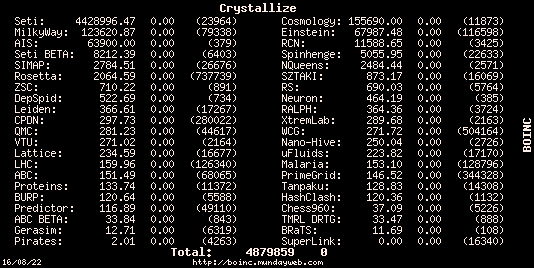 Message 952 - Posted: 7 Dec 2007, 16:14:48 UTC - in response to Message 951.
we've been working on getting boinc to automatically update and export the stats but it's being pretty cranky about it. so they're only updated when i run the tasks to do it manually (which means once a day or so). once we get them done automatically it should be multiple times a day. as for workunits, i'm pretty sure that they all take basically the same amount of time, so i'm not sure why one workunit would go longer than another (unless it was using a different volume size -- but this taken to account in our credit scheme so the longer work units give 4 credit at the moment because they run twice as long). Whats happened with credit validation? Depends again on benchmark while the server was out of work? My guess is that when the system went down, it turned off some features like fixing the credit. I am sure Travis will fix it when he see's whats going on and all benched results will be reverted back to fixed. Message 972 - Posted: 9 Dec 2007, 6:36:21 UTC - in response to Message 970. Either way, I'm not affected too much, yet. Most of mine had been claiming in the 1.8x to 2.0x region anyway. Who can guess, what's wrong with this picture ??? and it's a consistent error... something that should be checked up on ! Message 990 - Posted: 10 Dec 2007, 15:31:29 UTC - in response to Message 979.
the wrong validator got started up accidentally so it wasn't using fixed credit. this should be fixed now.